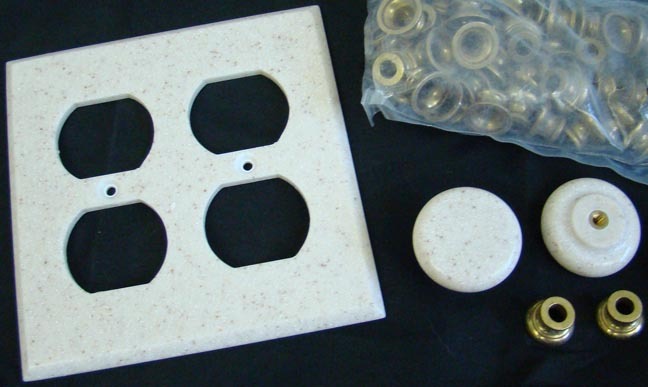 If you have Corian, Wilsonart, Staron, or other solid surface material counter tops or back splashes, here is how you can get matching switchplates. Rock Solid uses the real solid surface materials to make these plates. Solid surface material all the way through. Not just vinyl overlay paper or something cheap. These are high quality, made to match, electrical box covers. Any plate cover used to cover a gang box in your house, we will refer to as a switchplate, sometimes spelled as two words. 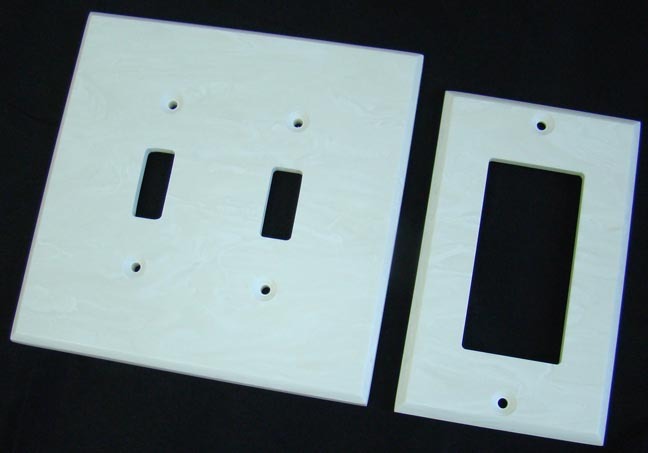 Whether it is for a light switch, outlet, phone jack, cable nub or dimmer, it is a switch plate. 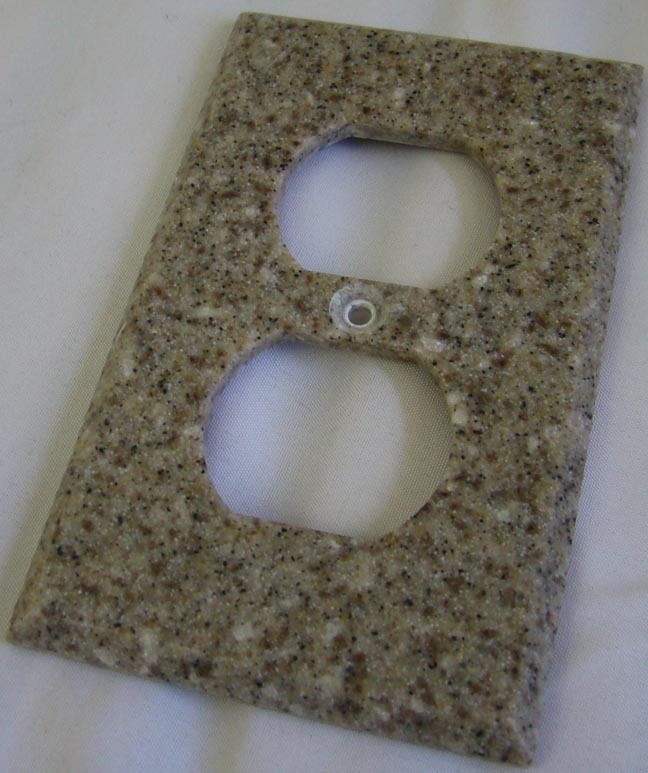 One of the many great things about switchplates from Rock Solid is: they are custom made. Thus, you can select from normal size to Standard Oversize to even a custom dimension if needed. And then great thing number two, you are not restricted to generalized cut out order. Plates can be made from single gang up to 5 gangs wide. And if you need a special configuration, such as toggle-toggle-toggle-rocker, you can request that. There are many common cut out combinations shown below in the black and white diagrams. But then you can use your imagination to think about all the combinations you could create. Or just look on your wall and see what you need. Corian and other solid surface brands are used for kitchen and bathroom counter tops, and sometimes sink basins are made from Corian. Shower and tub surrounds are made from Corian. Having matching switchplates, as well as cabinet pulls, towel bars, soap dishes and more, is a nice compliment to the solid surface already installed in your home. Some color pictures, part number diagrams, a price grid, and then ordering notes will be lower on this page. The ROC-621 plate on the left is the Standard Oversize. The ROC-613 plate on the right is normal size. Since all Rock Solid products are made from the real solid surface material, you can get matching knobs and switchplates. And match to bath hardware items too. They all coincide. 4-bank wide 8-1/8" W x 4-1/2" H; 5-bank wide 10" W x 4-1/2" H.
All switchplates will come with translucent color nylon screws. These blend with most solid surface colors and pick up some of the color through refraction. Also, they are soft, so when installing, it lessens your chance of over-tightening and cracking a plate. Singles 3-1/4" W x 5" H; Doubles 5" W x 5" H; Triples 7-3/8" W x 5" H. 4-bank and 5-bank can be quoted in oversize if needed. Standard Oversize plates will have the cutouts centered top to bottom and left to right. The purpose of them is just to give you an extra 1/2" in height and width to cover up any wall irregularities that the normal size plates cannot. A small chunk of drywall missing, torn wall paper, a bad cut in the surface around the gang box, etc. Rock Solid will make plates even larger, or smaller. We have to get a quotation from them each time. So if you have special size requirements, please e-mail us with your questions. In the black and white specification diagrams above, product code numbers are noted. Please enter the prefix: ROC-, followed by the code number, and then end the part number with the color BRAND and NAME. 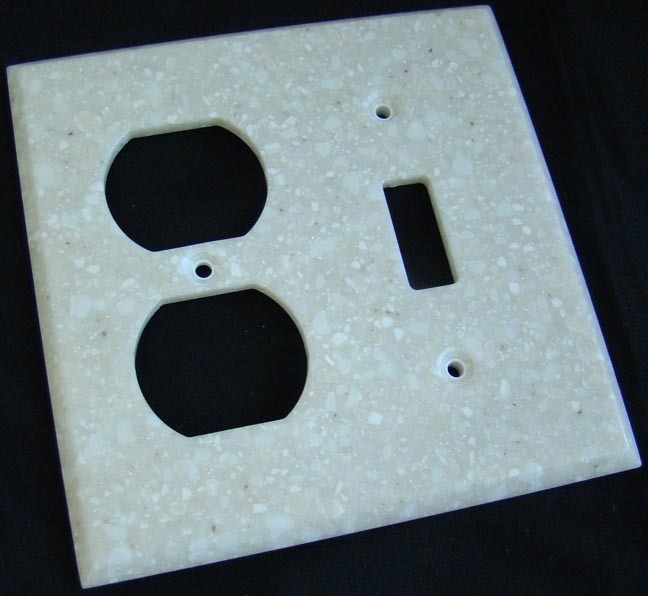 For example: ROC-611-Corian sandstone. Our ordering form is not an interactive shopping cart. If you mistype something, not a big deal. But do look over what you enter since many color codes or names are similar. Such as Corian Sand, or Corian Sandstone. Two different colors. To view current Corian colors from the Dupont web site, select this link. To view current Wilsonart solid surface colors from their web site, select this link. Formica®, Avonite®, Hi Macs®, Meganite®, and Staron® color availability can be provided prior to placing your order. We have to check with Rock Solid for material availability on these brands, and some less popular Corian and Wilsonart colors. Again, we will call or e-mail Rock Solid to inquire about color availability prior to you placing your order. PLEASE E-MAIL US WITH YOUR PRODUCT NUMBERS, QUANTITIES, AND COLOR DESIRED. 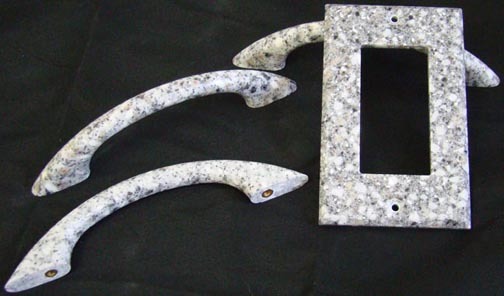 Most popular Corian® and Wilsonart® colors are stocked by Rock Solid. But because the US home building market slowed down greatly in 2007 and continues to be sluggish, their availability of fall out material has not been as abundant as it once was. (Fall out material means left over scraps from kitchen and bathroom installs.) The abundance of all Corian and Wilsonart colors is not happening as it once did (discontinued and current colors). Material brands such as CaeserStone, Silestone, Soapstone, and Cambria CANNOT be used by Rock Solid. They contain real stone or quartz and Rock Solid does not have the cutting tools to form these materials. Only man-made solid surface materials can be used. Rock Solid orders shipping to continental US addresses will be set up as direct ships from Wisconsin. For orders of $200 or more, there will be NO shipping charge. Orders shipping to Alaska, Hawaii, Puerto Rico, or the USVI, generally $22.50 for the shipping charge via US Priority Mail. Larger orders can cost just a little bit more as the weight increases. For Canada, Australia, or anywhere else outside the US, orders will ship to us first, and then we will add the proper International postage charge to ship it to you. We can quote shipping amounts prior to you placing an order. Please e-mail us with any questions. Margaret R., Hillsgrove, PA - ordered Corian Green Tea swicthplates.